One of the things that I never did with my son when he was a baby was put him in a carrier or use a sling for baby wearing. But that all changed when little Sadee-cakes came along. 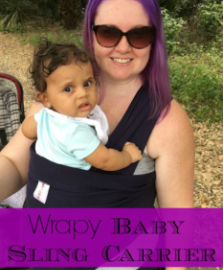 Now I am one proud baby wearing mama and thanks to Wrapy I have the perfect baby sling wrap for toting Sadee around. 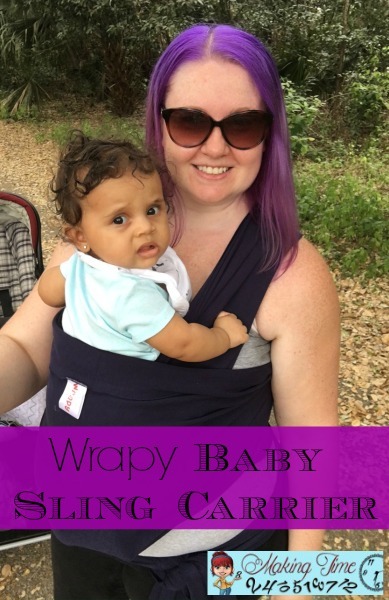 I understand that not everyone can get with wearing their baby, but here are my top 5 reasons why I love it, particularly with the Wrapy Baby Sling Carrier! 1 – The Wrapy Baby Sling Carrier is super comfortable for both mom and baby. One of the things I don’t really care for in a regular baby carrier is that the straps tend to be right where I don’t want them and oftentimes hit my baby’s face in the wrong place, or her arm rubs up against them. With a sling like Wrapy’s, I don’t have that problem. The sling is 95% cotton and 5% spandex, so it’s very soft and there’s nothing cutting into my baby’s skin anywhere. 2 – One size fits ALL! Yes, with the Wrapy Baby Sling Carrier there’s no worry about how big/small you are because it fits everyone. I’ll tell you, I’m a plus size girl and fit is always a worry of mine. I mean, I am wearing my baby so I have to make sure the sling fits me to be able to comfortably and properly carry her. I had absolutely no problem putting this sling on and even had extra material left when I tied it at the end. 3 – The Wrapy Baby Sling Carrier is easy to wash. I toss the sling right into the regular wash and even into the dryer, and I’m good to go. This is always a plus because we all know babies can be pretty messy sometimes – a little spit up here, some teething drool there – so an easy cleanup is awesome. 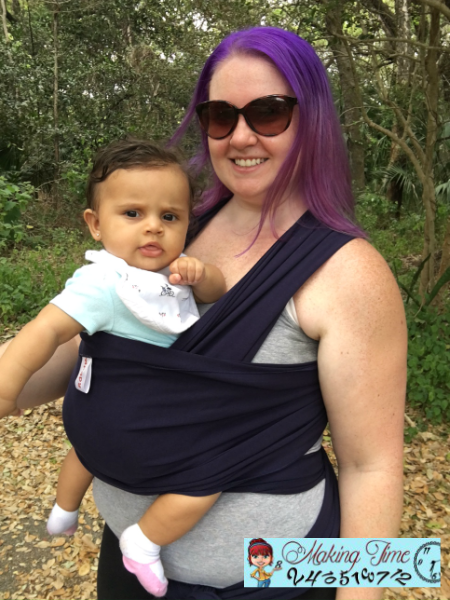 4 – There are 4 different positions in which you can wear your baby with the Wrapy Baby Sling Carrier – hug hold for newborn, hug hold for toddler (what I use now), cradle hold (great for nursing) and lotus hold (baby faces outward). Who knew you could wear a baby so many ways? 5 – And last, but not least – little Sadee is always close. There is nothing like the feel of your baby close to you all the time. Well, okay, I get it. You probably don’t want them around all the time, but you better get as much cuddle time as you can while they’re little because it won’t be long until they’re little monsters running a muck everywhere you go – I know, I have one of those too. Not only is it a good feeling to have Sadee close to me all the time, but it’s very comforting to her. No lie, every single time I wear her in our Wrapy Baby Sling Carrier she falls asleep. I had to be sure to get some pictures in during our walk at the park before she fell asleep because I knew it was only a matter of time. That’s all the proof I need at how comforting the sling is. So parents, sling on and wear your baby proud. And dad’s, the Wrapy Baby Sling Carrier isn’t just for moms. You’re just as much able to wear your baby and it gives you much more bonding time than if you didn’t, especially if mom is nursing. I nurse Sadee and love having so much time with her, nursing or wearing, but I know daddy wants some love too and baby wearing is the perfect experience for some daddy/baby bonding. *This post may contain affiliate links. I received a sample free of charge or at a discount, to provide an honest review. My opinions are 100% my own and in no way influenced by the brand. Any claims or statistics should be confirmed with the brand. Please see this blog’s full policies and disclosure here. It wasn’t for me when my boys were babies, but I know lots of moms like carrying their kids like this. A good wrap must be so important. Wrapy looks great. My sister used to have to do everything with one hand, because both my nephew and niece wanted to be held constantly. Yeap, been there. I have my moments at home where I have baby in one hand and trying to do something else with the other. Wrapy definitely helps! Your kiddo is so cute! My son hated when I would wear him he would cry the whole time. Where I live it is always hot and I just don’t think he’ll like to be in that hot. He would be sweaty all the time. My sister-in-law where’s her son and he loves it. We live in FL and I know all about the sweating and hotness. We definitely have to take breaks now and then because it does get a little warm when baby wearing…for both of us. I wore my first until I was too pregnant with my second. Then my husband wore the third while he played video games. Our second only ate and slept, then wasn’t interested. We are big fans of babywearing! I wish they were still small enough for me to wear. I miss it! I love it. I wore all of my kids and they are happy and well adjusted adults. I have pictures of me wearing my son with a napkin on his head so that I could eat! The Wrapy looks very comfy and easy to use. Your baby looks very happy with you for using it, that’s for sure! This looks like such a smart product! I never had anything like this when my kids were that age. Baby wearing is a lifesaver for me! I have three kids under 4 and without wearing one of them I am too out numbered! 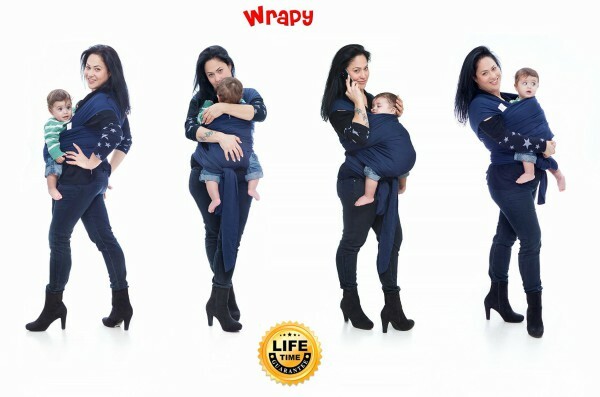 I loved having wraps and slings with my youngest. It’s so much easier to chase after older children and get anything at all done if you’ve got your baby with you and content. That looks really comfortable for baby AND mommy! I like the way it looks, too – very stylish! That looks very comfy. I wish I would have had one of these when my daughters were babies. These would have really come in handy. I love seeing momma’s carry their babies close. This style of carrier was about the only thing that worked for me, but I didn’t find it until child #4!! Loved it though. Baby wearing worked so well for me. I like to give a baby carrier at baby showers. I think it is great for Mom and baby. Your baby is too cute! I had something similar when my baby was little. Such a comfortable way to carry your little one around and still get things done. That wrap looks great for carrying a single baby. I’m a mom of higher order multiples, so I wonder if there’s an option for twins and triplets, too? I never wore my babies. I tried, but it was before they had these cool wraps. The new era of baby wearing just revived when I had my kids. The appartuses were uncomfortable and complicated. The one size fits all aspect of the Wrapy Baby Sling Carrier and the simple design appeal to me. Being able to use it in 4 ways gives it total bang for the buck. 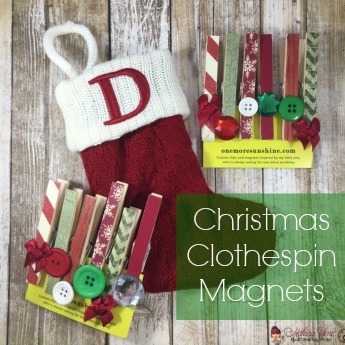 What a great shower gift idea! These things are so great! I love them because your hands are free and baby is still as close as they can be.